Intensely real war games, emulating actual battlefield experiences, have become extremely popular among both military and civilian personnel. RIR presents 5 Russian war games, the scope and intensity of which will amaze you. “Zarya” is the “daughter” of the Soviet “Zarnitsa,” which was played by the pioneers of war games. The goal of that game was to seize and hold the defences, and not surrender to the enemy. The goal of “Zarya” is much the same as its Soviet predecessor; the development of patriotism and promotion of a healthy lifestyle. But the means have become much more complex. Participants are now provided with airsoft (replica) weapons and real military equipment, BTR and “Urals”, howitzers and tanks that even shoot blank shots. These help players to experience a real battlefield. Unlike other war games on this list, anyone can participate in “Zarya” as it is not restricted to military personnel only. A T-72 tank, instead of skis, and a tank gun instead of a sporting rifle! All the rest is exactly like in a normal biathlon - running, shooting, and penalty loops in case of errors. This is all done while driving bulky military vehicles. Along the way, the tanks have to maneuver and overcome the obstacles; pillars, scarps, land barriers and anti-tank ditches. After overcoming the obstacles, the tank comes to a shooting range where it shoots the target - from a tank gun and a Kalashnikov tank machine gun, which is mounted on the tank turret. The tank biathlon has become the basis for other similar military competitions - with the use of aircrafts, armoured personnel carriers and even ships. Unlike the tank biathlon, the Aviadarts setting most closely emulates the conditions of a real battle. In the first stage of the competition, the aircraft crew must determine at a high level of accuracy the location of three objects of the imaginary enemy. The team is not only required to locate the target, but also to clearly define its type. The pilots pass the obtained information to the control centre, and then proceed to the bombing. At first, the bomber crew must drop the bombs into the zone within a radius of 30 metres, and then hit the enemy equipment with a missile from a diving bomber. The role of enemy vehicles is performed by decommissioned tanks and armoured personnel carriers. The skills assessed are piloting skills, the accuracy in destroying ground targets and destruction of defence systems by the aircraft. The Military derby is a combat training competition of armoured vehicle crews. It is similar to the tank biathlon, but uses the BTR instead of tanks. The competition begins with an individual race of the crews in which the machines must overcome complicated high-speed sections, minefields, hills and other obstacles. Each BTR-80 must take two laps. After the race, the crew members must perform a variety of physical training exercises including shooting pop-up targets from different stationary positions, shooting from the rolling deck of an assault boat, and hitting a fixed target in the daytime, while performing a parachute jump. International Army Games will be held in the first half of August 2015 on ten ranges of three military districts of Russia. There will be teams from 25 countries to participate in this competition. 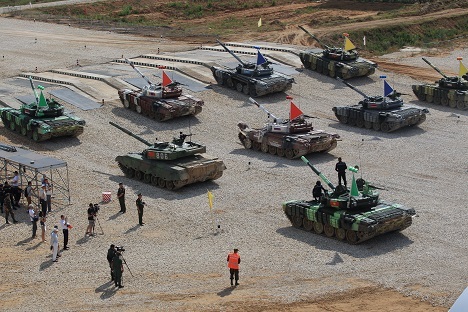 In addition to the tank biathlon and aviadarts, which are already familiar to foreigners, the Army games also will include the international competition for the naval derby, not only for the Marine Corps, but also for the ship crews. The arena for the event will be the Caspian Sea, and the participants will be the countries that border it (Azerbaijan, Iran, Kazakhstan, Russia and Turkmenistan). The framework of international games will also include BMP racing (with possible participants including Angola, Argentina, Armenia, Belarus, Brazil, India, Iran, Kazakhstan, China, Cuba, Mongolia, Russia, Serbia and Tajikistan). This is a competition which involves mortar calculations, engineering and de-mining troops, radiation, chemical and biological protection troops, technical support troops, and even pontoon units, who would need to bridge the anti-tank ditches and rivers.